Following the article are comments from best-selling and award winning authors Garth Nix and Neil Gaiman, and also from Jayne Dearsley, Reviews Editor of SFX Magazine. “Thirty-five years ago, when I was twenty-one, I was idling away time at my parents’ house in the country, wondering what to do next. 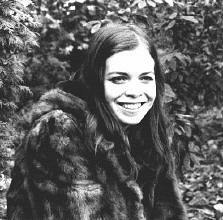 I had been living in London and taking music lessons and it had dawned at last that I had no musical talent whatsoever. So with no particular end in view I found my mother’s portable typewriter and wrote a story for children. Of course I wrote it for myself, really. I may have looked grownup - a heavy Juliette Greco fringe, so much eyeliner that my father complained that it was like looking down the barrels of the guns of Navarone over breakfast, reeking of Shalimar and French cigarettes (rolled in papier mais for super sophistication) - but I was extraordinarily naive. It simply never occurred to me to get a job or to think of a career. Instead I spent eight months, off and on, writing this story just as it came into my head, sentence by sentence, with no idea of how it would finish or what I would do with it when it had. "One evening I went out to dinner with a friend in London. In the late Sixties the Bistro D’Agran - I’m not sure how you spell that - was a well-known Hooray Henry haunt behind Harrods. It was unlicensed so customers had to bring their own bottles of wine. I can’t remember who the friend was but at the table next to us were two men who asked to borrow our corkscrew. During the conversation that followed one of the men revealed that he was a publisher. Without a blush I told him that I was within days of finishing a manuscript. It did not occur to me that he might be constantly bothered by people asking him to look at unsolicited manuscripts. Generously he said I could send it to him for appraisal. I did. A few weeks later, during which I had heard nothing and had practically forgotten about it, he sent me a contract. That was Bill McCreadie of Rupert Hart-Davis (now of Aurum Press) and the story came to be called The Winter of Enchantment.
" I was mildly gratified and grateful for the fifty pounds advance. The book sold quite well and was made into a television serial. But by then my thoughts were elsewhere. With money left me by my grandfather I bought a hill farm in mid-Wales and began to live the rural idyll. We had forty Welsh black cows and two hundred sheep and a ruined farmhouse in an otherwise unpopulated valley. It was extraordinarily beautiful. A river ran through it, passing the farmhouse door. Islands in the river were shaded by trees, the sides of the valley were rocky and covered with bracken. Not a hedge or a fence or a pylon were visible. We had no electricity or telephone. Our only plumbing was a cold water tap that came from a well behind the house. Not surprisingly everyone who came to stay got paratyphoid. We cooked over an open fire in a black pot that we had found lying outside. The house had no glass in the windows and during the first winter one of the gable end walls fell down during the night so we sat by the fire looking out on snowy hills. I don’t remember thinking then that this was a strange way to live. "I lived there with two men, a Polish count - so he said - and an Englishman who had been in prison for ten years for killing a man - accidentally, he said. Looking back I wonder what on earth I thought I was doing. I suppose the Sixties and flower power had made risk an essential part of the well-lived life. The accidental assassin was probably a fundamentally decent man but the Polish count was horrid. I was going to say ‘wicked’ but it has just occurred to me as I write this that there are uncomfortable parallels about living in an isolated beautiful place with a malevolent bully - let’s not be fanciful. Like characters from Wuthering Heights, never speaking except in a snarl, occasionally actually coming to blows, we waded through torrents of rain and seas of mud. I fear the animals may have suffered under our inexperienced stewardship and what I saw there made me a vegetarian for life. The rural idyll was one of the circles of hell. After three years I left in tears. We never did get glass put in the windows. "But I did find time between trying to get cows out of bogs and chickens out of foxes to write a sequel to The Winter of Enchantment. I wrote it with the same ingenuous passion. If these stories have any merit it must be that they are innocent and childlike, written by one who was essentially still a child herself. Bill McCreadie, ever patient, ever kind - for I’m sure I was a complete pain, always in the throes of some drama of my own making -had moved to Andre Deutsch so I changed publishers with him. This time I had an advance of seventy five pounds. This was The House Called Hadlows.
" After I left the farm in Wales I lived on my own for a while on the shores of Skye. I was extremely lonely but it was an opportunity for some long overdue reflection. I realised that I needed to learn. I had been to a soppy girls boarding school, which didn’t take women’s education seriously and anyway I didn’t listen. So I went to Cambridge as a mature student to read English and there I discovered that there was such a thing as structure, pace, cadence, style, good and bad writing. This was useful but it also closed a door. I could never again write in prelapsarian innocence. "I married immediately after graduating, had two children, took up gardening with enthusiasm, was happy and occupied. Over a period of about four years I wrote another novel for children, different from the others. Better or worse I cannot tell. I tried half-heartedly to find a publisher. The market for children’s books had changed, I was told. Fantasy adventures were unpopular. Most children preferred television and the computer games that were just then being produced so literature had to be snappy, realistic, above all short. 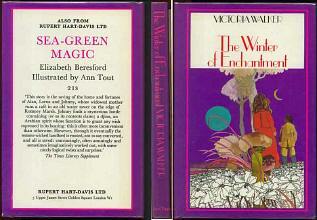 "THE WINTER OF ENCHANTMENT was one of the favourite fantasy novels of my childhood. I found it at age 10 or so, in a battered paperback edition that initially caught my eye because of the green (or possibly red) dragon on the spine, some long-gone publisher's colophon. That initial attractor was soon forgotten when I started reading the story. There were no dragons, but it had many others things that I liked a lot. A boy led by a silver teapot and a cat from 19th century London into a fantasy world. A villainous Enchanter. An imprisoned girl who has learned some sorcery herself to good effect. Winter, spring, summer and autumn incarnate. Summoned winds to carry said boy from the rooftops. A giant emerald . . .
Neil Gaiman, professional writer for over 20 years, one of the top writers in modern comics and a best-selling novelist has written about Victoria Walker and her books in the past. The following extracts are from his website. “And then I got that strange tingly feeling you get when someone mentions a book you'd loved once and half-forgotten almost for forever -- in this case The Winter of Enchantment, which was on the shelves in my local library when I was about eleven, and which I remember as being utterly magical, although the actual what-happened is a confused sort of jumble of magic mirrors and cats and the four seasons and victoriana. I did a web search and learned nothing except that Garth Nix has really good taste in kids' books. "I first read 'The House Called Hadlows' when I was ten years-old, and I can honestly say that if I hadn't, I wouldn't be a writer now. Victoria Walker's imagination fired my own in such a way that I think it's criminal that her books are out of print and youngsters of the 21st Century aren't reading them. What are they missing out on? Magic, beauty, danger, excitement... Walker painted new worlds and amazing adventures that put the stuffy schoolrooms of Hogwarts to shame. 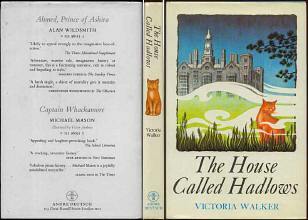 "Both 'The Winter Of Enchantment' and 'The House Called Hadlows' are children's classics. I spent over 20 years searching for them - a literary holy grail that I finally tracked down through eBay, of all things! I'm thrilled to pieces that there's a chance that the books will be reprinted. Now I have my holy grail, I don't want to be the only person to drink from it. The magic should be for everyone." Jayne Dearsley, Reviews Editor, SFX Magazine. Keep an eye on SFX Magazine for a feature on Victoria Walker and the Ibooknet web site for these sought-after and collectable childrens titles as well as Victoria’s recent adult novels penned under her married name of Clayton.